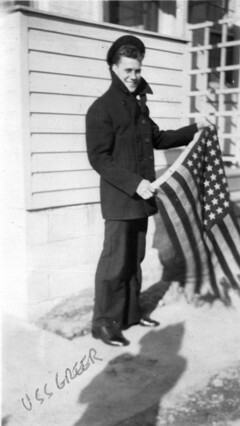 ReSignalman Joe Moll with Greer ensign, ca. 1942. The first American shots of World War II were depth charge salvos from USS Greer, DD 145, 4 September 1941, three month before the United States declared war. Greer, named for Rear Admiral James A. Greer (1833–1904), was one of 48 flush-deckers built at William Cramp & Sons Ship & Engine Building Co., Philadelphia. She was launched 1 August 1918, commissioned 31 December and initially served with the Atlantic Fleet, transferring to the Pacific Fleet in 1919 and to the Asiatic Fleet in June 1920. Greer decommissioned in 1937 and was placed in reserve at Philadelphia Navy Yard but recommissioned in October 1939, shortly after the start of World War II in Europe. She retained her general appearance at this time, but in 1941 had one stack removed. In February 1940 Greer was assigned to the North Atlantic Neutrality Patrol. After a cruise to the Caribbean Sea beginning in October, she returned to the North Atlantic in early 1941, operating generally between Newfoundland and Iceland with a good crew under LCdr. H. L. Frost and Cmdr. G. W. Johnson, ComDesDiv 61, embarked. At 0750 on the morning of 4 September 1941, she contacted a British plane; five minutes later, the plane reported a submarine. Greer closed and gained sonar contact. At 0930, the bomber attacked the target with four depth charges, then returned to base. Greer continued tracking her contact over the next two hours while a relief plane arrived. At 1140, with the submarine on her port bow, Greer sighted two torpedoes and turned toward them, successfully evading. Ten minutes later, she dropped ten depth charges on the submarine but in so doing lost contact. U-652, a German Type VII-C submarine, was laid down at Hamburg on 5 February 1940 and commissioned on 3 April 1941. In eight war patrols in the Atlantic and Mediterranean, she sank five ships including British destroyer HMS Heythorp off Libya on 20 March 1942. At 1230, not having regained contact, Greer resumed course for Iceland. A British destroyer appeared and then departed. Five minutes later, Greer regained submarine contact and dropped nine more depth charges. The submarine, U-652, was undamaged. Greer remained on patrol in the Atlantic and Caribbean until 1944, when she was assigned to coastal duties. She was decommissioned at Philadelphia July 1945 and sold for scrap that November. Sources: Greer deck log for 4 September 1941, conversations with Greer shipmate Joe Moll; Morison, DANFS.